This is the first volume in a complete survey of Bach’s harpsichord concertos, recorded by La Risonanza in one-to-a-part practice performance. With his Fifth Brandenburg Concerto of 1719, Bach had created the first ever harpsichord concerto. From 1729, in Leipzig, the opportunity arose to continue this experiment: each week at Café Zimmermann he conducted his Collegium musicum in orchestral concerts that lasted around two hours. In the summer of 1733, he took delivery of “a new harpsichord, the like of which has not been heard before around here”. This magnificent instrument, which featured at the Zimmermann concerts, urgently called for concertos to be played by himself as soloist, and even more so his sons and students. Not only in Saxony but also well beyond, Bach was considered to be the absolute authority in all things harpsichord and organ; he thus had to make his own contribution to the emerging genre of the “clavier concerto”. The manuscript of his six harpsichord concertos BWV1052 to 1057 should therefore be understood as a repertoire collection for his Collegium musicum, and as a compositional manifesto. Whilst the concertos in D minor and E major are substantial works, the concertos in A major and F minor are far more compact. Both display noticeable influences of the galant style and were therefore probably not written before 1730. "Contagious rhythms, set in passionate teamwork, in combination with a perfect sound reproduction, makes this recording into a party." "The Challenge Classics recording, as heard from the high-definition stereo layer is very good – clear but warm." "Harpsichordist Fabio Bonizzoni does a credible job in integrating the concertos so that they appear not as a soloist versus the ensemble, but rather as an integral part. " "Natural and uncomplicated. In Bach that's a pretty good balance to bave." 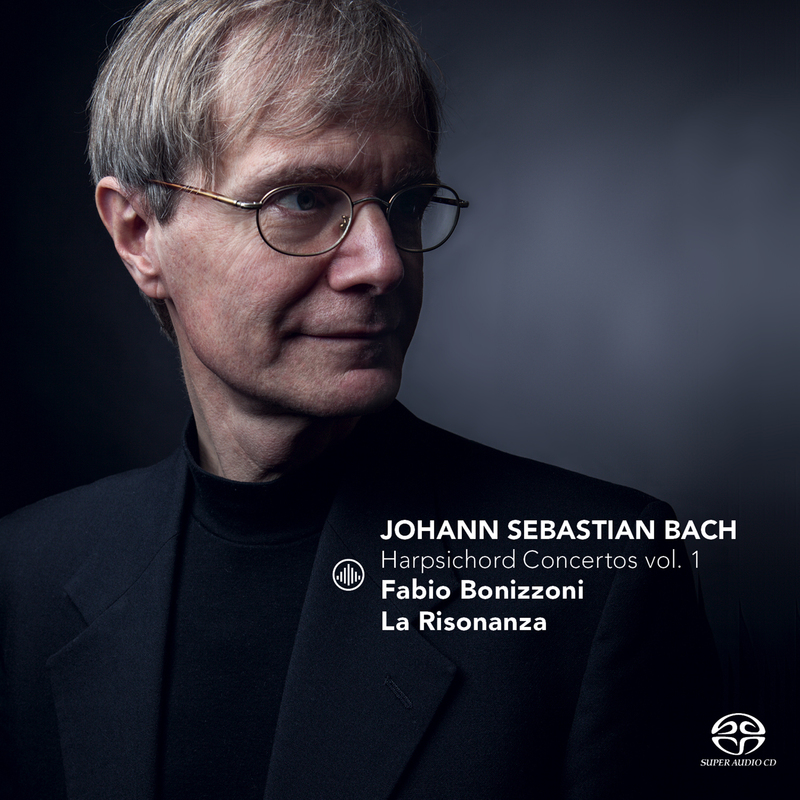 Bonizzoni chose a one-to-a-part performance...an option that - also thanks to the superb quality of the recording - doesn't jeopardize the presence, the drama nor the expressivity of these works, while it extolling some details, the rhetoric, some magic moment: like in the Adagio of the BWV 1056. Inspired performances with a remarkably warm and well textured sound. "Catchy rhythms, driven encased combination, coupled with perfect sound reproduction, make this recording a feast. The Italian musician Bonizzoni leads his ensemble perfectly to the example of Bach, who composed his concerti according to the Italian model. Quality assured!"